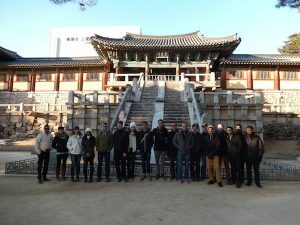 We concluded cultural weekend with an early morning road trip across the country from Gunsan to Ulsan. Although the trip is literally from the west coast to the east coast, it only took four hours. We had lunch at a rest area which offers multiple restaurants, souvenir shops, convenience stores, and a small amusement park. Hopefully, American rest areas will one day provide services beyond a bathroom and a vending machine. 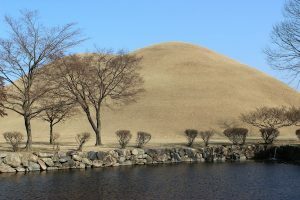 Along the way we made a couple of cultural stops at World Cultural Heritage Sites, such as royal tombs in Daeneungwong shown above, the Seokguram Grotto in Gyeongju, and the Bulguksa Buddhist temple that is also in Gyeongju. Our first visit was the royal tombs. The name Gyeongju was actually renamed from Sarabol, which means center of universe, after there was a change in kingdom ruling. The tombs are large mounds that hold the royal corpse, which faces the east, and a multitude of ornaments and belongings that they would need in the afterlife. The mounds consist of layers of clay and large rocks that create a fortress without any entrance points. Before the 1st century, the royal servants would be killed and buried along with their ruler so they can continue to serve the royalty in the next life. 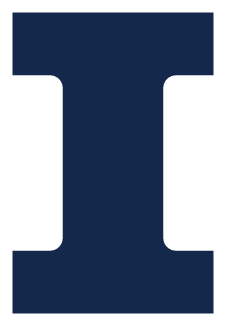 However, that tradition was discontinued after the 1st century. The tombs are located in the midst of a residential area, and at one point two treasure thieves made a failed attempt of digging an underground tunnel from a nearby house to King Michu’s tomb. Fortunately, the authorities were able to stop them before the tunnel was completed. 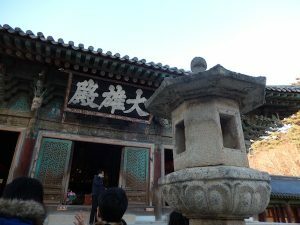 The Seokguram Grotto is located on the top of the slopes of mount Tohem. Mr. Kim, our tour bus driver, driving through all the curves along the slopes was an adventure in and of itself. Those who have weaker stomachs definitely felt some motion sickness by the time we arrived at the top. Established in the 8th century, the seokguram is an artificial grotto composed of 360 granite stones that houses a 3.5 meter tall statue of Buddha looking out to the sea. A viewing of the sunrise over the sea is a very popular activity for both tourists and local residents. Our last cultural stop, the Bulguska temple was built in 528 and was classified by UNESCO as a world cultural asset in 1995. Only the stone foundations remain original, since the temple was burned down following a Mongolian invasion. 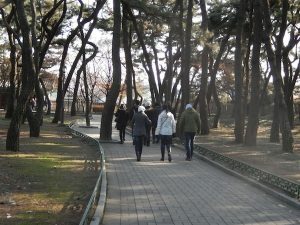 The temple has faced multiple renovations after the Korean War when the area was bombed. At the entrance of the temple there is a bridge that represents a border between the Buddhist world and the modern world. The main shrine has 33 steps that represent the 33 castles that are believed to exist in the paradise. 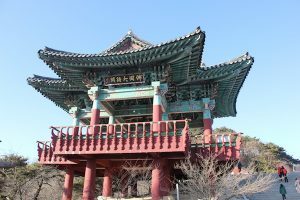 The Dabotap and Seokgatap are two of the most valued pagodas in Korea. Their designs vary drastically, as the western pagoda displays a feminine, decorative look and the eastern pagoda is more strict and simple. In 1968, while performing renovations the world’s oldest wood block printing was found. To avoid problems with the wood swelling and shrinking during the change of seasons, not a single nail was used to construct the temple. This construction technique is common in other Asian countries. Japan used this method as a way of creating seismic resistant homes. Upon the completion of our tour through the temple, several of us placed a small pebble on a pile as a form of making a wish to the Buddhist higher powers. We finally made it to Ulsan and enjoyed another dinner of fabulous chicken wings.